A sequence of numbers follows a pattern. If you can find that pattern, you can find more numbers in the sequence! In this tutorial, you'll see how to find the next terms in a sequence by first identifying the pattern of that sequence. 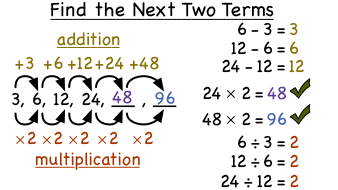 Finding the missing terms of a sequence is a breeze, as long as you know the pattern for the sequence. Follow along with this tutorial to see how to find the pattern of a sequence and then use it to find missing terms of that sequence!